Chakra meditation technique focuses on the nerve centers or energy vortices within the body that regulate our physical, mental and emotional well-being. Meditating on the chakras regularly cleanses and balances them. This balancing brings inner poise and unlocks hidden reserves of energy within us. Chakras, Sanskrit for wheel, are quite literally whirling vortices of life-force that lie along the body's energy pathways. While they do correspond to certain glands, plexuses or organs in the physical body, they are essentially centers of spiritual consciousness along the first sheath or pranamaya kosh of the astral body (click to learn more about the three bodies). 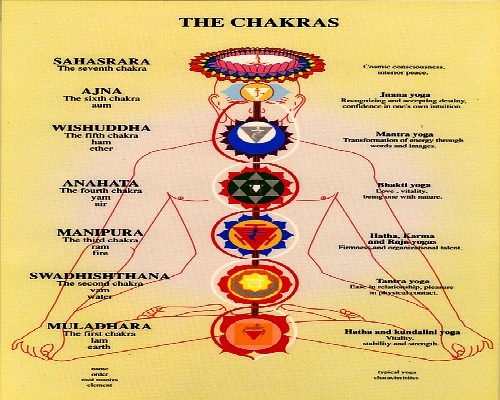 There are seven main chakras centered around the base of your spine (who you are), lower abdomen (how you feel), above the navel (what you do), heart (how you love), throat (what you say), forehead (what you know) and crown of the head (how you connect with the universe or higher power). Then there are the minor chakras - significant ones being the plantar chakra (sole of each foot), hand chakra (palms), tortoise chakra (upper sternum) and moon chakra (above your palate). Chakras are often depicted as lotus flowers - a powerful symbol in Indian tradition symbolizing the yearning and movement from the gross to the subtle. Similar to the lotus flower, which grows in muddy waters but strives toward sunlight, a meditator aspires for enlightenment while rooted in the illusory world of maya. The table below lists the properties of the seven main chakras to help you better practice the chakra meditation technique. Finally, if you start feeling vulnerable, you may wish to visualize the closing of the petals in each of the chakras before ending your meditation.